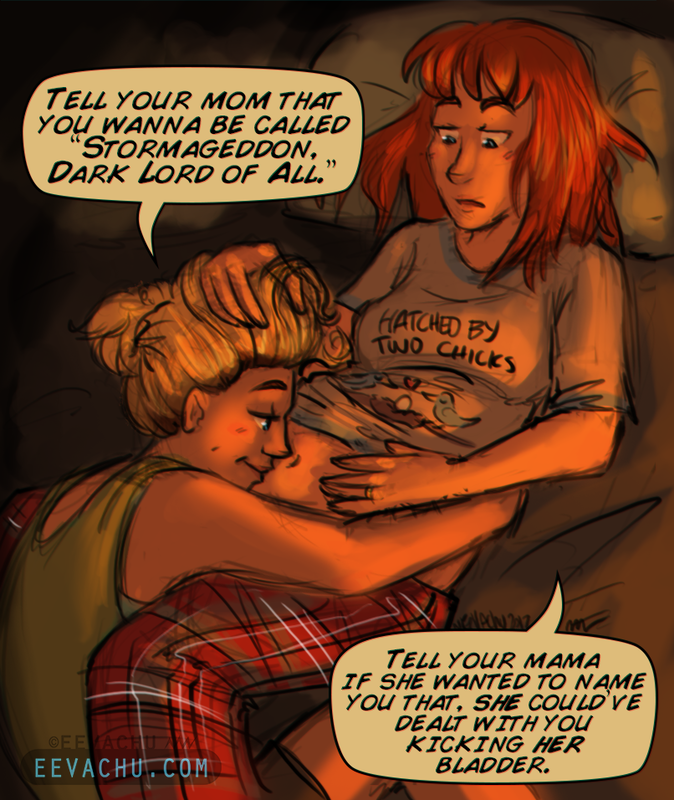 This prompt sent me spiraling into pregnant Holtzbert headcanons because like… hi, welcome to Eevachu’s SECRET JAM. I love it, thank you for giving me an excuse to INDULGE. The Ghostbusters end up with one particular teen girl who becomes the Holtz to Dr. Gorin, but for Holtz (the rest of the gang love her too). They end up basically adopting her, and since Holtz and Erin are a couple they’re the ones that do the most “parenting” stuff. When the kid goes off to college they get all empty-nester and they’re both like, “That one turned out great, we should grow one of those ourselves.” And a coin toss and MANY costly medical things later: boom, they cannot agree on any sort of baby name for mini-Erin/Holtz. This kiddo comes to adore and idolize her big adopted sister btw and is just so smart and this little clone of Erin with all of Holtz’ energy, which is terrifying. Around the same time the freshly baked Holtzbert bun goes off to school, Holtz is just like, “I THINK WE SHOULD HAVE ANOTHER ONE, AND THIS TIME I WILL TAKE THE RING TO MORDOR.” And so Holtz carries their second kid (who grows up to be a large dude Holtz: brilliant, charming, eccentric, a little neurotic and just worships the ground women walk on). [deep breaths] Okay, I’m done, Femslash February requests still open all month, rules over here! Gimme more of this GOOD GOOD STUFF. 2017. Adobe Photoshop CS6; Wacom Cintiq 22HD; Original size.